Donna was born and raised in Canada, which is where she obtained her degree in Physiotherapy. 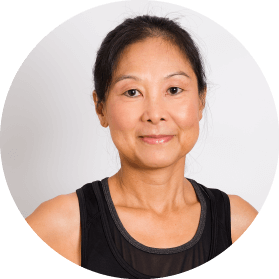 Donna worked in acute care and rehabilitation hospital settings, as well as out patient physiotherapy clinics in Canada before moving to Hong Kong with her family in 1991. She joined The University of HK Health Services Unit in 1992 working as a physiotherapist in the outpatient clinic. While she was at HKU, Donna studied Chinese Medicine, Acupuncture along with a variety of other manual therapy techniques. Six years later, Donna’s curiosity brought her to attend a workshop hosted by the Founder of one of the first Pilates Studios in HK. What she learned that evening motivated Donna to learn more about Pilates which led to her becoming a certified B.E.T. instructor as well as a certified Pilates instructor. From this moment on, her passion for rehabilitation using Pilates grew and grew. Donna has treated clients starting as young as 6 yrs old up to 80 yrs old, helping each client re-align, and recover from acute and chronic pain. The past 5 years has been focused on post natal diastasis recti recovery. Donna’s personal experience with her own recovery from sprained ankles, knee injury, low back pain, neck pain, and 4 pregnancies, is why Donna is so passionate about teaching postural alignment and core stability to everyone! Donna takes a holistic approach to wellness thus incorporating multiple skills to bring the body into balance physically, mentally and emotionally.